Detective Chief Inspector Neil Sloan of Cambridgeshire Police told a meeting of Cambridge’s Community Safety Partnership on the 23rd of July 2013 that Cambridge is about to see many more police officers patrolling on bikes. DCI Sloan said that the officers will largely be new officers, who don’t know the city, and getting out on bikes will help them rapidly get to know the geography and problem areas. The officers will be focusing on a city wide priority of tackling “acquisitive crime”; ie. 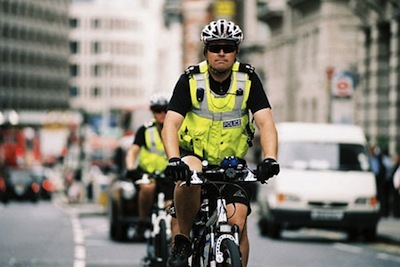 burglary, robbery, and thefts including specifically cycle thefts; but they’ll also be generally policing and tackling so called “anti-social cycling”. I think getting more police using bikes is a a good idea in the city, however I was concerned to hear of a resurgence of a focus on “anti-social cycling” at a city wide level after councillors on the North Area Committee removed it as one of their priorities after concerns had been raised that the poor quality of infrastructure and signage made enforcement unreasonable and unfair in many cases. To-date we have primarily seen only PCSOs on bikes; using recovered stolen bikes. In 2008 two bikes were donated to the police for them to use on patrol. The Community Safety Partnership were not told about the bikes which the officers will be riding, and if for example they will be fitted with blue flashing lights and sirens. Ambulance service paramedics already use bikes in Cambridge. This entry was tagged Cambridge, Community Saety Partnership, Cycling, Police on July 23, 2013 by Richard Taylor. Report by @CambsCops says police officers on marked bikes will patrol Cambridge to enforce cycle laws http://t.co/n3RoWa2QfI < Spotted any?